Abstract: This study deals with the calcite mylonites of the Brunovistulian sedimentary cover developed in the frontal thrust area of the Moravian nappe units. The inhomogeneous structure of sedimentary protoliths allowed the analysis of the contrasting behaviour of calcite in matrix and porphyroclasts and the interpretation of microfabric evolution during deformation under low temperature conditions. Several stages of microfabric evolution characterizing progressive as well as retrogressive deformation are distinguished. Generally, the progressive phase of mylonitization is characterized by grain growth in the matrix and the grain size reduction of the porphyroclasts leading to a stress-induced equilibration of grain size. During the initial deformational stages the calcitic porphyroclasts deformed brittlely and the strain was strongly localized into the ductile matrix. With continuing evolution the onset of the dynamic recrystallization of porphyroclasts occurred, which obviously preceded a significant grain growth in the matrix. With rising temperature during deformation, grain growth predominated after grain size homogenization was finished. The lack of effective dynamic recovery along the stages of the progressive low temperature phase of deformation is discussed. Core-and-mantle structures which are characteristic of the initial stages of progressive deformation carry microfabric features which document the dominance of grain boundary bulging and/or nucleation recrystallization. Formation of subgrains within the porphyroclasts is only a rarely observed feature which probably could not lead to significant grain size reduction. The higher effectiveness of nucleation and recrystallization via migration of grain boundaries compared to subgrain rotation mechanism could be a consequence of high fluid content. Large-scale thrusting within the Brunovistulian basement is shown by the juxtaposition of calcitic and quartzitic mylonites with deformational microstructures reflecting pronounced contrasts of deformational styles. Fully plastic vs. fully brittle behaviour of quartz represents the most pronounced indicator of different deformational conditions between the lower unit of the Svratka Dome and the other domains of the Brunovistulian basement. In the lower tectonic unit of the Svratka Dome the microtructures of calcite mylonites indicate stresses which were about four times lower than in the other two parts of the Brunovistulicum. Despite the deformational contrasts, the values of illite crystallinity measured do not show any spatial gradient which could be linked with the distribution of the contrasting deformational microstructures. The paleothermometric data which are available to date suggest maximum paleotemperatures of 250–300 °C for all three studied domains of the Brunovistulian basement and it is suggested that the difference of Variscan peak temperatures between the three compared domains of the basement was not higher than several dozens of °C. The observed deformational contrasts can thus be explained by an abrupt change of deformation mechanisms in both calcite and quartz at temperatures around 300 °C. Abstract: A study of fluid inclusions from the ore samples from the Mlynna dolina valley (Nizke Tatry Mts, Western Carpathians) has provided information on the formation conditions of the mineralization. Arsenopyrite and pyrite are accompanied by quartz with CO2-rich, low-to-moderately saline (3.6–15.4 wt. % NaCl eq.) fluid inclusions with homogenization temperatures of 281–365 °C and estimated trapping pressures between 150 and 350 MPa. Arsenopyrite thermometry suggests a crystallization temperature of 320–380 °C, thus overlapping the fluid inclusion data. Subsequent decrease in temperature and pressure were probably responsible for the fluid devolatilization and the precipitation of stibnite and berthierite at temperatures of 200–250 °C and pressure <100 MPa. Formation conditions of chalcopyrite – tetrahedrite assemblage are poorly constrained due to the paucity of fluid inclusions. These homogenize at 157–187 °C and indicate an aqueous fluid with a salinity of 17.9–22.0 wt. % NaCl eq. Superimposed galena-sphalerite assemblage is hosted by quartz containing fluid inclusions with a salinity of 16.3–22.5 wt. % CaCl2 eq. and homogenization temperatures between 95–202 °C. Preliminary thermometry and mineralogical data for mineralizations of the Mlynna dolina valley suggest a close genetic similarity to other ore deposits in the Nizke Tatry Mts. Abstract: Lower Triassic formations in the Aggtelek–Rudabanya Mountains (NE Hungary) were mapped in the main part of the Silica Nappe, and the results are presented in a new map at the scale of 1:50,000. The aim of this paper is to present the structural observations collected during mapping and to interpret the field data and map-scale structures, and by this means to demonstrate the structural setting of Lower Triassic formations in a new light. The mapped area is located south of the Jósvafő–Bódvaszilas reverse fault-zone and divided into two parts by the NE–SW sinistral strike-slip faults of the Darnó Zone. Beside these two major fault-zones, systems of E–W dextral strike-slip and NE–SW-trending reverse faults were recognized. Three groups of folds were identified: one set of folds with NE–SW axes is predominant and widely distributed in the entire mapped area, whereas the other sets of folds with E–W and NW–SE axes appear only locally. Their timing is uncertain. Characteristic associations of structural elements were recognized in three structural segments. The predominant one consists of E–W trending strike-slip and the connecting NE–SW reverse faults with a series of folds with NE–SW axes, suggesting NW–SE shortening and NE–SW elongation (according to recent co-ordinates). Map-scale anticlines and synclines were also formed in this system (e.g. the Dobódel and Keskeny-völgy Anticlines and the Varbóc Syncline). The map-scale structures reveal that the formerly proposed anticline with E–W axis running all along the Jósva-völgy does not exist; only the E–W-trending Jósvafő Anticline is proved near Jósvafő. Strike-slip duplexes and push-up fragments, consisting of mismatching blocks, are also very characteristic in the area of investigation, pointing to major lateral shear zones. 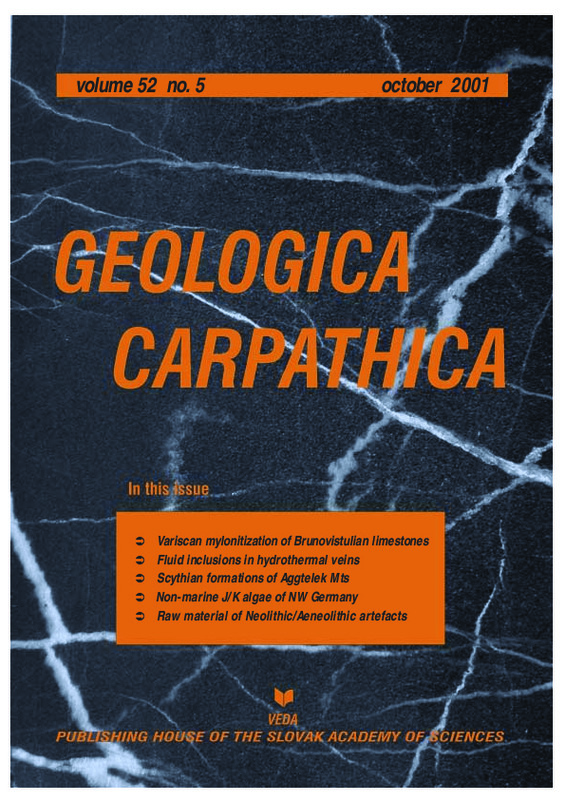 Abstract: The Upper Jurassic/Lower Cretaceous brackish carbonate sequences of the Weserbergland area (NW Germany) contain numerous calcareous algae and cyanobacteria closely associated with layers dominated by serpulids and ooids. Algae are an essential tool for the interpretation of brackish environments. Several new taxa of Chlorophyta (Pseudopenicillus weseri n.sp., Springerella bifurcata n.gen. n.sp., S. fuchtbaueri n.sp., Brachydactylus reisi n.sp.) and one new species of Cyanobacteria (Ponsella freyteti n.sp.) are described. Abstract: The polycultural site of Nitriansky Hradok-Zamecek, 35 km SE of the town Nitra, is characterized by its rich collection (several hundreds!) of stone bases and crushers. They are made mostly of metaconglomerates, in less amount also of andesites, basalts, granodiorites, metaquartzites and sandstones. The provenances of the raw materials are Tribec Mts (metaquartzites, metaconglomerates, granodiorites), Late Tertiary volcanic mountain ranges of Pohronsky Inovec Mts, Stiavnicke vrchy and Kremnicke vrchy (andesites and basalts) as well as the Neogene sediments (sandstones) of southern Slovakia.